Bindi is a great example of where work life and passions collide. Her career in natural resource management and sustainable agriculture integrates perfectly with her off-the-clock interests, including owning Happy Wombat Hazelnut Farm near Batlow in the region’s south-east and seeking out the wide variety of birds and wildflowers endemic to the region. She believes the Riverina provides a landscape like no other – where you can follow the Murrumbidgee River and travel from snowy ranges in the east, across agricultural holdings, past largescale irrigated farmland and onto the Hay plains and rangeland in the west – all in a day. But you might want to take longer if you want to peel back the layers in each landscape, she adds. Pinning down her five best experiences in Wagga and surrounding region was difficult, but for visitors looking to immerse themselves in the great outdoors while visiting, Bindi put forward some of her favourites. 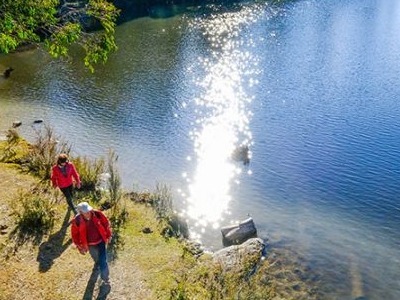 Wiradjuri Walking Track: This is an amazing, easy walking trail that is so accessible from the CBD of Wagga and provides so many natural environs to explore – the Murrumbidgee River with its platypus and free summer swims, majestic River Red Gums and two lagoons. Wollundry Lagoon is such a luxury to have in the middle of town – home to native ducks, cormorants, grebes, the elusive Nankeen Night Heron, White faced Heron, Rakali and if lucky in spring, seeing Sacred Kingfishers feeding their young at the entrances to tree hollows after hatching. Yarrangobilly Caves: This is such a unique high country experience, wander through these beautiful accessible caves, then if you can make the walk, swim in the thermal pool or the River. Keep an eye and ear out for Lyrebirds. It’s really where to go when you want to get away from it all – the lack of phone coverage encourages it! The Rock Hill Nature Reserve: The spectacular views from the top of The Rock make the walk up worth it for many reasons – including providing a real insight into the scale of agricultural production in all directions. The Rock itself (known as Kengal to the Wiradjuri people) is such a beacon in the landscape, and sitting quietly there provides a real sense of place. Watch the Peregrine Falcons launch off the rock faces or keep an eye out for the many beautiful wildflowers in spring. Travelling Stock Routes: There are thousands of hectares of TSRs in the Riverina and the better patches are what I call ‘living herbariums’, taking you on an adventure of discovery. Because many have been managed differently to farmland, they give a terrific insight into what native vegetation of the surrounding area would have been like prior to European settlement. Riverina Local Land Services who manage these areas can help you find these hidden treasures, one of my favourites near Wagga is Mates Gully Reserve, on a spring morning you are literally surrounded by melodious calls from woodland birds with the waft of chocolate drifting up from the flowering native Chocolate Lily . Adelong Falls and historic gold mill ruins: From the moment you arrive the sound of water flowing over rocks can be heard. Lots can be seen from the viewing platform or for a closer look take the walking track. The semi-restored ruins are a fabulous part of history, and the site to me is a demonstration of the resilience of the natural environment to recover after mining disturbance. Although not rare, two favourite plants that have naturally regenerated are The Wedding Bush (Ricinorcarpos bowmanii) and Barbed Wire Grass (Cymbopogon refractus).